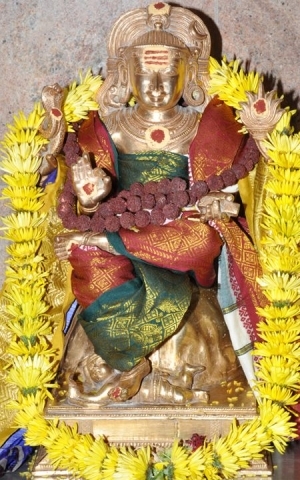 Šri Dakshinãmoorthy, sits facing the South and is a foremost spiritual teacher. He is said to impart spiritual knowledge, encouraging us to acquire wisdom through silent meditation. He is seated under a banyan tree, stepping on a dwarfish demon that represents ignorance and ego, symbolically assuring us that with His blessings, we could get rid of both our ignorance and ego. Ego is considered to be the biggest obstacle of spiritual growth.